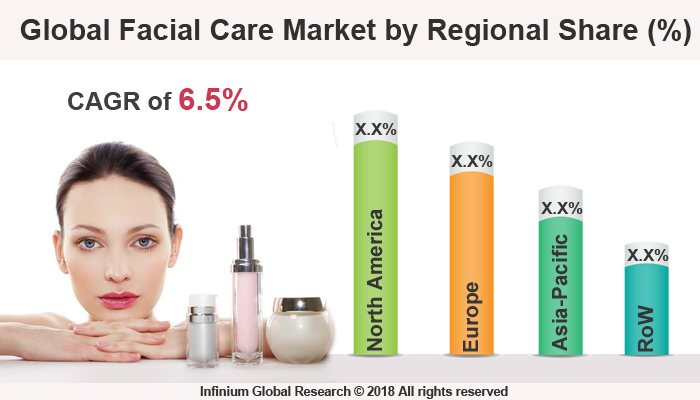 A recent report published by Infinium Global Research on facial care market provides in depth analysis of segments and sub-segments in global as well as regional facial care market. The study also highlights the impact of drivers, restraints and macro indicators on the global and regional facial care market over the short term as well as long term. The report is a comprehensive presentation of trends, forecast and dollar values of global facial care market. According to report the global facial care market is projected to grow at a CAGR of 6.5% over the forecast period of 2018-2024. Facial care is the maintenance of the face and its features such as the skin, lips, and eyelashes so that it has an attractive, youthful appearance. The facial care products come under the skin care treatments products. It includes cleanser, toner, antioxidant serum, eye cream, spot treatment, moisturizer, sunscreen, eye cream and so on. These are used to maintain skin health as well as for specific skin conditions. Facial care segment contributes around 3/4th of the total skin care market’s revenue. This growth can be attributed to the growth in a wide range of products including BB creams, anti-aging creams, moisturizers, cleansing wipes, skin toners, masks & serums, and so on. This, in turn, has resulted in the availability of a wide array of products to the customers and further has increased the penetration of facial and personal care products. Rising awareness about the facial care products and new multinationals entering the market are other factors boosting the growth of the global facial care market. The increasing esteem of multifunctional products and growing distribution channels and networks are further propelling the growth of the global market. In addition, increasing fairness products demand, rising focus on an advertisement, and changing lifestyle of consumers are some other factors impacting the global facial care market growth. Growing disposable income among younger consumers, especially women, and growing awareness about several benefits of facial care as improvement of personality for physical appearance etc. are helping to boost the market globally. But, lack of awareness about several facial creams among consumers, fluctuating cost of ingredients as petroleum-based products, a governmental ban on some ingredients for application in skin cream are hampering the growth of the market for the medium term. However, growing disposable income among young consumers especially among women in developing countries, intensive marketing by beauty products companies, increasing application of online purchasing of facial care products are expected to boost the market for long term. North America and Europe dominate the global facial care market with maximum share. However, Asia-Pacific region is showing a robust sustainable growth for facial care market, due to increasing demand from middle-class families, due growing disposable income and entering of a large number of the female workforce in the corporate worlds. Additional other factors as governmental support for the enhancing the earning capacity of rural households are boosting the demand of several facial care products in developing countries. The report on global facial care market covers segments such as, product type, distribution channel and end user. On the basis of product type the global facial care market is categorized into skin whitening/ lightening and anti-ageing, facial creams, face wash, cleansing wipes, serums and masks and others. On the basis of distribution channel the global facial care market is categorized into conventional store, departmental store and online store. On the basis of end user the global facial care market is categorized into male and female. The report provides profiles of the companies in the global facial care market such as, L’Oreal S.A., Procter and Gamble Company (P&G), Estee Lauder Companies Inc., The Unilever Plc., Shiseido Co. Ltd., Johnson and Johnson Limited, Kose Corporation and Kao Corporation. The report provides deep insights on demand forecasts, market trends and micro and macro indicators. In addition, this report provides insights on the factors that are driving and restraining the global facial care market. Moreover, IGR-Growth Matrix analysis given in the report brings an insight on the investment areas that existing or new market players can consider. The report provides insights into the market using analytical tools such as Porter's five forces analysis and DRO analysis of facial care market. Moreover, the study highlights current market trends and provides forecast from 2018-2024. We also have highlighted future trends in the facial care market that will impact the demand during the forecast period. Moreover, the competitive analysis given in each regional market brings an insight on the market share of the leading players. This report will help manufacturers, suppliers and distributors of the facial care market to understand the present and future trends in this market and formulate their strategies accordingly.